Clarendon is a vibrant, bustling community filled with exciting restaurants, shops, and plenty of neighborhood events. Just a short train ride from downtown DC, the population has increased significantly over the last decade. Lyon Place has been a fixture of the community for the last six years and is the premier rental community in the neighborhood. What Makes Lyon Place Great? Lyon Place is committed to making life as easy as possible for the residents. That means convenient dry cleaning and package drop off, a front-desk team who is familiar with everyone in the building, and a community that operates like a well-oiled machine. There are numerous on-site events including happy hours, early morning weekday breakfasts for those who need to grab food on-the-go, as well as fitness classes and community-wide meet-and-greets. One of the most common pieces of feedback we receive from the busy professionals who live in the building is how appreciative they are for the property managers and on-site staff. The building sits virtually on top of the Clarendon metro which means residents can walk out their apartment door and be underground in minutes. There is even a private entrance close to the station that allows residents to avoid the worst of the weather on a rainy day. Residents rely on the real-time transit board in the lobby that provides live train updates so commuters know when to race for the next train and when to take their time. Lyon Place residents live on the same block as one of the most popular grocery stores in the country. A large section of the ground floor of the building is occupied by a Trader Joe’s, so community members can pop downstairs for essentials after a busy day at work. There is also a Whole Foods within easy walking distance for those who want additional options. If whipping up a meal from scratch isn’t in the cards, residents have convenient access to South Block Juice Co, Bracket Room, Circa, and Clarendon Grill — all located on the ground floor of the property. 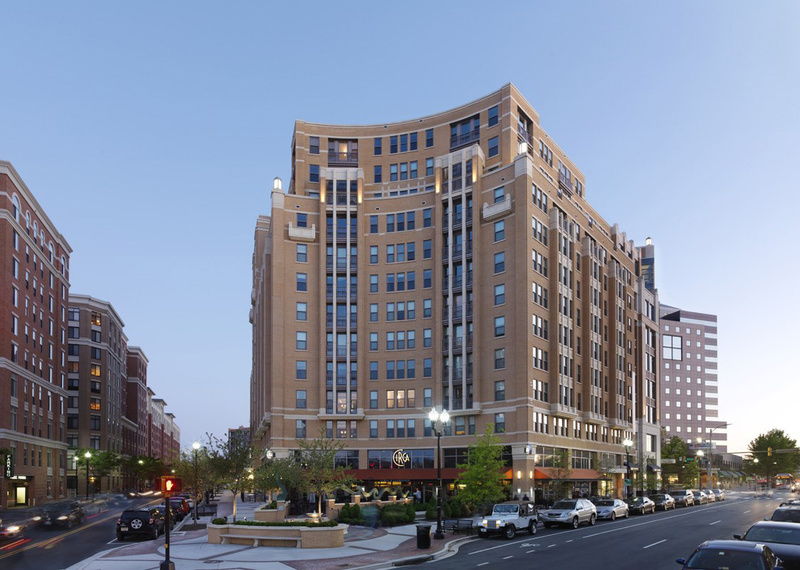 The roof of the building offers expansive views of downtown DC, Alexandria, and Fairfax, VA. There’s comfortable seating and fob access so residents can enjoy the private outdoor space at any time. It may be a small perk, but it’s one of the best spots in the region to watch the Fourth of July firework shows and you can watch the sun sparkle over the Potomac River. With no nearby buildings blocking the view, it’s a breathtaking way to take in the sights. For anyone looking to rent a luxury apartment in Clarendon, Lyon Place has what it takes to make you feel right at home.